The relationships of the major decapod infraorders shown above is based on the phylogeny estimated by Porter et al. (2005). Abele, L. G. 1991. Comparison of morphological and molecular phylogeny of the Decapoda. Memoirs of the Queensland Museum 31:101-108. Abele, L. G. and B. E. Felgenhauer. 1986. Phylogenetic and phenetic relationships among the lower Decapoda. Journal of Crustacean Biology 6:385-400. Dixon, C. J., S. T. Ahyong, and F. R. Schram. 2003. A new hypothesis of decapod phylogeny. Crustaceana 76:935-975. Feldmann, R. M. 2003. The Decapoda: New initiatives and novel approaches. Journal of Paleontology 77 (6):1021-1039. Kim, W. and L. G. Abele. 1990. Molecular phylogeny of selected decapod crustaceans based on 18S rRNA nucleotide sequences. 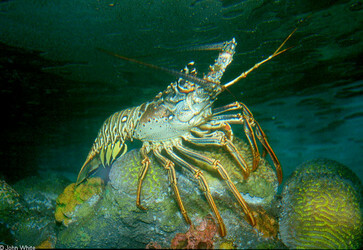 Journal of Crustacean Biology 10:1-13. Martin, J. W. and T. A. Haney. 2005. 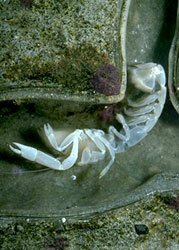 Decapod crustaceans from hydrothermal vents and cold seeps: a review through 2005. Zoological Journal of the Linnean Society 145(4):445-522. Miller, A. D. and C. M. Austin. 2006. The complete mitochondrial genome of the mantid shrimp Harpiosquilla harpax, and a phylogenetic investigation of the Decapoda using mitochondrial sequences. Molecular Phylogenetics and Evolution 38(3):565-574. Morrison, C.L., A. W. Harvey, S. Lavery, K. Tieu, Y. Huang and C.W. Cunnigham. 2002. 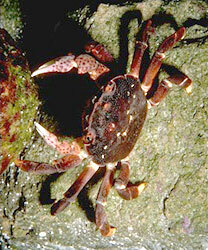 Mitochondrial gene rearrangements confirm the parallel evolution of the crab-like form. Proceedings of the Royal Society of London Series B 269:345-350. Porter, M. L., M. Pérez-Losada, and K. A. Crandall. 2005. Model-based multi-locus estimation of decapod phylogeny and divergence times. Molecular Phylogenetics and Evolution 37(2):355-369. Scholtz, G. and S. Richter. 1995. Phylogenetic systematics of reptantian Decapoda (Crustacea, Malacostraca). Zoological Journal of the Linnean Society 113:289-328. Schram, F. R. 2001. Phylogeny of decapods: moving towards a consensus. Hydrobiologia 449:1-20. Page: Tree of Life Decapoda. The TEXT of this page is licensed under the Creative Commons Attribution-NonCommercial-ShareAlike License - Version 3.0. Note that images and other media featured on this page are each governed by their own license, and they may or may not be available for reuse. Click on an image or a media link to access the media data window, which provides the relevant licensing information. For the general terms and conditions of ToL material reuse and redistribution, please see the Tree of Life Copyright Policies.